Put the pistachio nuts in a jug and cover with warm water. Allow to soak for at least 20 minutes. Drain but reserve the soaking water. Place the nuts in a food processor and add 2tsp honey and a little of the reserved water. Blend to form a thick paste. Place the halved peaches in a shallow roasting tin and dot with butter. 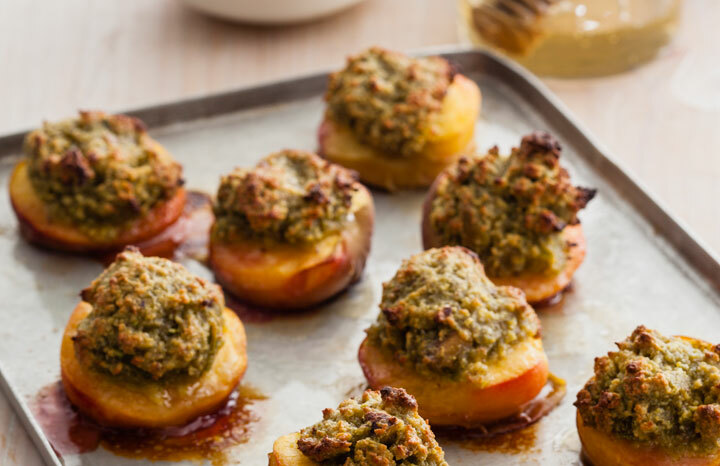 Spoon the pistachio paste into the centre of each peach half. Drizzle over the remaining honey and roast for 15 minutes or until the peaches are just tender and lightly browned. Serve with a little yogurt if you like. Recipe from Christine Bailey. Christine is an award winning Nutritionist, Chef and Author with over 18 years of experience. A simple dessert– use either plums or fresh peaches when in season. You can make up a batch if you like and serve the peaches cold for a breakfast too.